The ESRC Consumer Data Research Centre is inviting proposals from UK-based academics for projects that will capitalise on their core consumer data sets, extend their network of partners, and drive forward substantive and innovative social science research across a broad range of disciplines and research areas. The Centre is looking to fund in the region of 8-10 projects, each valued at between £20,000-£60,000 (100% fEC). Projects will run from early October 2017 and must be completed no later than the end of September 2018. Deadline for Applications: 5pm 31st July 2017. For more information, please visit the Consumer Data Research Centre. Categories: Funding Opportunities, Researchers | Tags: Data, ESRC | Permalink. The Chancellor’s Fellowships are an ideal opportunity for staff who are developing potential policy-related impact linked to an evidence base in their research findings. The fellowships offer staff access to funding of up to £9,000 to cover the costs of a placement with an external organisation that can help to accelerate policy impact. Organisations can include government departments (international, national or local), think tanks, charities and businesses. 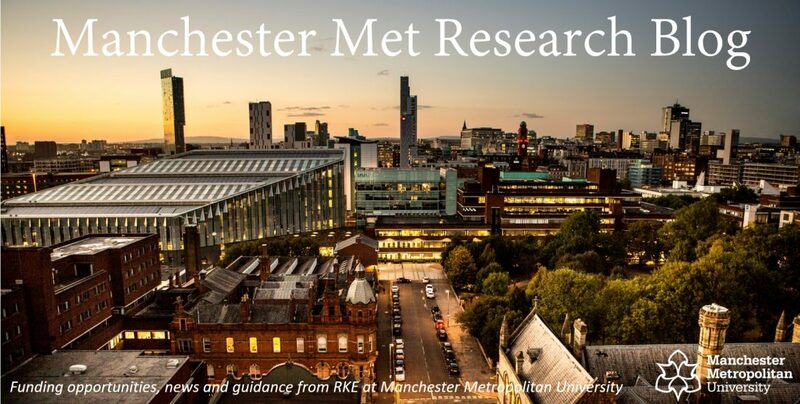 Established or establishing researchers from Manchester Metropolitan with a proven track record of high quality research with the potential to translate into policy impact are eligible to apply. The deadline for applications is 5pm on Monday the 3rd of July 2017. Should you be unable to submit at the moment, we will be announcing another call later this year (dates TBC). If you would like to discuss a possible Fellowship idea or application, please get in touch with Emily Goodier. The EU-India Platform for Social Sciences and Humanities (EqUIP) is pleased to pre-announce its first research funding call. The call aims to bring together social science and humanities funders in India and Europe to support excellent and innovative research on sustainability, equity, wellbeing and cultural connections. The emphasis of the research will be on Indian and European dimensions, in both contemporary and historical contexts. Research proposals should focus on societal challenges facing both India and the respective European countries, with suggested themes including, but not limited to, sustainability, equity, wellbeing and cultural connections. Funders strongly encourage interdisciplinary approaches across the social sciences and humanities (SSH) to address the themes of this call. Each proposal under this call will require the building of consortia of three or more research groups based in three or more different countries participating in the call and be eligible for the funding from their national funding agencies. Every proposal must involve representation from India eligible for funding by the participating Indian funding agencies. In the case of the UK the research group can consist of an individual researcher or group of researchers. The call for proposals is expected to open end of August 2017. Categories: Funding Opportunities, Researchers | Tags: Humanities, Social Science | Permalink. The Arts and Humanities Research Council (AHRC), Economic and Social Research Council (ESRC) and the UK Foreign and Commonwealth Office (FCO) are pleased to invite applications to the AHRC-ESRC-FCO Knowledge Exchange (KE) Fellowships scheme. The scheme will provide the opportunity for each intake of fellows to be seconded into the FCO to work alongside, advise and influence policymakers. For more information, please visit the ESRC. Categories: Funding Opportunities, Researchers | Tags: AHRC, ESRC, Fellowship, Policy | Permalink. The Immersive Research Development Partnerships, backed by AHRC and EPSRC is a new £2m call for development of early stage research partnerships that can explore the creation of new immersive experiences addressing the call’s three key themes: Memory, Place and Performance. To support the call, a series of seven briefing events across the UK have been planned to provide detailed information about the call. One will be held in Manchester. There will be opportunities to explore the call themes, as well as meet and network with potential partners and the AHRC Creative Economy Programme team. For more information and to register attendance, please visit Immersive Experiences. These events will offer an opportunity to gain a greater understanding of the NIHR Public Health Research (PHR) programme. Registration to these events is FREE. Additional interactive webinar – 20 September 2017.